I think I’d better dance now….. I just want your extra time and your KISS. After days of posting on the Mumbai massacre (and the details emerging), it is a pleasure and a joy to read The Anchoress’ beautiful post on Advent: The Coming of Love. Francis Porretto (who hopefully will continue podcasting!) has Interventions: Two Guest Ruminations, by Aaron Brenzel, and by the beautiful Duyen Ky, who writes about luck. ‘I was told to kill to my last breath’: Was the Mumbai attack a probing attack? According to the account of Kasab’s interrogation, given by police sources, the terrorists were trained over five months in Pakistan-occupied Kashmir, then had a month off before the attacks. At some stage, they also received intensive instruction in ‘marine assault’ operations. Kasab and the nine other terrorists, who communicated using BlackBerry mobiles, began their journey to Mumbai on November 21. Initially unarmed, they left an isolated beach near Karachi in a small boat, before being picked up the following day by a larger vessel. At this point they were each given eight hand grenades, an AK-47 rifle, an automatic pistol and ammunition. And in anticipation of a lengthy siege, they also carried dried fruit. Four of its crew are missing while the fifth has been found dead, apparently beheaded. Its owner and his brother are being questioned by police. On November 23, after reaching Porbandar in the Indian state of Gujarat, 310 nautical miles from Mumbai, the insurgents were intercepted by two coastguard officers. The group hoisted a white flag and allowed the two men to board their boat. According to Kasab, one of the militants then attacked one of the officers, slitting his throat and throwing him overboard. The other man was forced to help the group reach their destination before being executed as the vessel drew near to Mumbai. For most of the journey, Kasab’s friend, 25-year-old Abu Ismail, a trained sailor, steered the vessel using GPS equipment. Three speedboats met the Kuber a mile and a half from the Mumbai seafront on Wednesday. After waiting for the light to fade, they moved off, later transferring to two inflatable dinghies to go ashore. The article has a lot more details on the terrorists’ operation. As I read, there is a question that has been bothering me for several days now (which I didn’t have the opportunity to ask in yesterday’s excellent SAJA podcast):Was the Mumbai attack a probing attack? Training and preparation: not only the terrorists were trained, the logistics were worked through well ahead of time – including the access to weapons and ammunition. Use of sea routes, with the boats used to reach the urban peninsula. A new variety of suicide attack: the lengthy siege. All carried out by a small number of personnel, organized into buddy pairs. And, as the captured terrorist said, the purpose was to kill 5,000 people. All this points to me to the likelyhood that the attack was a probing attack, a dress rehearsal, if you allow the term since this was the first time this tactical approach was used in a large scale setting, for the terrorists to see what went wrong when they couldn’t kill the number of people they were after. They will study the events of the last four days and will use this information in a future attack elsewhere (in another capital which will be a business and communications hub, with access by a body of water) where they will kill 5,000. Sebastian D’Souza hears the gunfire at Chhatrapati Shivaji Terminus from his office across the street at the Mumbai Mirror tabloid. He follows the sound through the sprawling station, slipping unseen through parked trains. When he first catches sight of the young men, he doesn’t realize they are the gunmen. They look so innocent. Then he sees them shooting. “They were firing from their hips. Very professional. Very cool,” says D’Souza, the newspaper’s photo editor. For more than 45 minutes he follows as they move from platform to platform shooting and throwing grenades. Often, D’Souza isn’t even 30 feet away. The few police at the station are either dead, in hiding or had long fled. When whole populations come under siege, as is the case in Israel, the unnatural instinct to resist eventually becomes part of the culture. The instinct to fire back supervenes over the natural inclination to flee. The most important effect of the Second Amendment is that it it implants the germ of the idea that resistance is a viable option. It’s a germ which must be nurtured by a little training. The gun is an easy thing to find. It’s the making of a shooter which is harder. The third, striking at the funding and at the terrorist supporting states, is larger problem for our time. And then, exterminate the terrorists. On a related story, Gerard VanderLeun prays Kaddish in memory of Rabbi Gavriel Holtzberg and his wife Rivka, who Rabbi Holtzberg managed to cover her body with a tallit (Jewish prayer shawl) before he himself was killed. Their son Moshe turned two yesterday. “I WANT TO LIVE” says the surviving terrorist (h/t Baron). Massive government spending is no solution to unemployment. The New Deal is Mr. Obama’s context for the giant infrastructure plan his new team is developing. If he proposes FDR-style recovery programs, then it is useful to establish whether those original programs actually brought recovery. The answer is, they didn’t. New Deal spending provided jobs but did not get the country back to where it was before. This reality shows most clearly in the data — everyone’s data. During the Depression the federal government did not survey unemployment routinely as it does today. But a young economist named Stanley Lebergott helped the Bureau of Labor Statistics in Washington compile systematic unemployment data for that key period. He counted up what he called “regular work” such as a job as a school teacher or a job in the private sector. He intentionally did not include temporary jobs in emergency programs — because to count a short-term, make-work project as a real job was to mask the anxiety of one who really didn’t have regular work with long-term prospects. The result is what we today call the Lebergott/Bureau of Labor Statistics series. They show one man in four was unemployed when Roosevelt took office. They show joblessness overall always above the 14% line from 1931 to 1940. Six years into the New Deal and its programs to create jobs or help organized labor, two in 10 men were unemployed. Mr. Lebergott went on to become one of America’s premier economic historians at Wesleyan University. His data are what I cite. So do others, including our president-elect in the “60 Minutes” interview. As a result of such policy, pay for workers in the later 1930s was well above trend. Mr. Ohanian’s research documents this. High wages hurt corporate profits and therefore hiring. The unemployed stayed unemployed. “If you had a job you were all right” — the phrase we all heard as children about the Depression — really does capture the period. Government can’t create wealth, but it can certainly hinder it. New Deal-type spending won’t be the way out of the current financial crisis: public works spending requires a lot of tax increases, card-check implementation will strengthen union size and demands, and the environment those actions will generate will be hostile to business, which will continue fleeing to more agreeable locations overseas. Cafe Hayek explains aggregate demand. Too bad Krugman isn’t reading. To answer the question in the post title, going by Krugman recommendations, if we aren’t yet, we soon will be. Capital investment is the secret of creating new jobs, and the secret of promoting capital investment is a business environment that offers the opportunity for . . . (wait for it) . . . profit. Don’t miss the SAJA podcast live at 10AM and 10PM Eastern for news and the best analysis on the web. Fox’s Strategy Room continues to livestream New Dehli TV‘s live coverage. Tracking the rich tradition of Jews in India, via Judith. Al-Qaeda websites on Thursday were swamped with messages from people who were celebrating the devastating Mumbai attacks which have left over 100 people dead and 281 injured. “Oh Allah, destroy the Hindus and do it in the worst of ways,” was one of the comments that appeared on Islamist forums on the Internet immediately after the attacks. via the Baron, who also sent this photo essay [warning: many gruesome photos]. Note the failed car-bombing aimed at the Mumbai airport, at Barcepundit‘s roundup. More links added throughout the day. Don’t miss tonight’s SAJA podcast at 10PM Eastern. Bill Roggio: Mumbai Attack Most Significant Since Sept. 11 Attack on U.S. The mode of attack–assault teams launched into the heart of a major city–is already sending chills down the spines of security officials and governments throughout the world. Regarding the murder of the hostages at the Jewish Center, The Holtzbergs: Not “Ultra” and Not Missionaries. You must read this entire post, as a clip won’t do it justice. The Holtzbergs’ two-year-old son, Moshe, was smuggled out of the building last night and is now with his grandparents. Officials in India, Europe and the United States said likely culprits included Islamist networks based in Pakistan that have received support in the past from Pakistan’s intelligence agencies. Analysts said this week’s attacks surpassed previous plots carried out by domestic groups in terms of complexity, the number of people involved and their success in achieving their primary goal: namely, to spread fear. Several analysts and officials said the attacks bore the hallmarks of Lashkar-i-Taiba and Jaish-i-Muhammad, two networks of Muslim extremists from Pakistan that have targeted India before. Jaish-i-Muhammad was blamed for an attack on the Indian Parliament in 2001. Both groups have carried out a long campaign of violence in the disputed territory of Kashmir, which India and Pakistan have fought over for six decades. The roots of the long-running conflict are religious: A majority of India’s population is Hindu, while most Pakistanis are Muslim. Four prongs in the al-Qaeda strategy. My latest post, Heading to Australia Today is up at LadyBlog. 12:15PM Eastern Fox News reports there are no survivors at the Jewish Center. 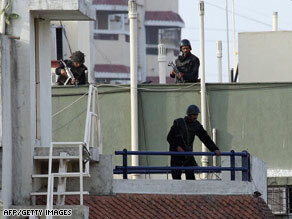 Two Britons were among eight gunmen being held, according to Mumbai’s chief minister Vilasrao Deshmukh. Barack Obama’s plan to enlist Pakistan in the fight against al-Qaeda in exchange for improving its relations with India has become one of the potential casualties in Mumbai. Commandos slid down ropes from a hovering Army helicopter on Friday morning as they stormed a Jewish center that had been seized. The blue-uniformed troopers landed on the roof and soon made their way inside Nariman House, home to the Hasidic Jewish group Chabad-Lubavitch. The caution and pace of their maneuvers suggested the authorities were keen to avoid civilian casualties. Throughout Friday, a gun battle raged inside the Jewish center, which echoed to the thump of explosions and the rattle of automatic fire. There was no immediate word on the fate of hostages assumed to be held there. Late in the day, commandos in black uniform wearing heavy body armor moved into buildings around Nariman House, relieving commandos in blue or black uniforms who had been in action all day. For the first time, a van with six medics in surgical gowns and masks parked close to Nariman House, apparently in anticipation of casualties. Indian security forces claimed some success in rescuing hostages from the five-star Oberoi hotel but still appeared to be encountering resistance inside the ornate, turreted Taj Mahal Palace and Tower Hotel. The hotels were two of several of the city’s landmarks hit by the attackers late on Wednesday. 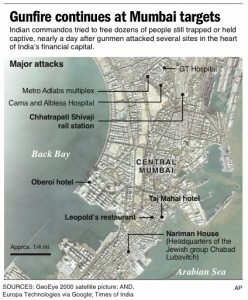 The fighting between Indian commando units and Islamic terrorist gunmen holding an orthodox Jewish center in Mumbai is in its “final stage,’ according to police officials. Earlier reports said the siege had ended. Commandos emerged from building Friday night, local time, with their assault rifles raised as a crowd outside the building cheered. There was no word on the fate of the hostages believed to be inside. According to Fox News five hostages are dead. According to sources in Mumbai, armed groups and individuals have attacked at least ten (if not more) targets inside the city including the Taj Hotel, Oberoi Hotel, a railway Station, the Leopold Café and other locations. More shooting incidents have been also reported at the Trident hotel, a hospital and a highway leading to the airport and Assembly Hall. The terrorists fired indiscriminately against civilians, security elements, lobbed grenades, and killed Counter Terrorism officials. At this writing sources are reporting more than 102 deaths, amd hundreds wounded, in addition to hostage taking. Indian security sources confirmed the use of AK-47s, small arms, grenade, etc. This type of operation, involving a number of small groups and individuals “deployed” across several avenues, In my book Future Jihad I coined these types of forthcoming strikes as “urban Jihad” (Chapter 13). Instead of bombers and suicide bombers, the command sends “Jihadi infantry.” The tactical goal of these actions is to engage in different types of missions: random kilings, chaos, killing of security officers and hostage taking. Jawa is following the story. Via Instapundit, Barcepundit has the overnight news update. 9:35AM Eastern The NDTV anchorman: “War has been declared on Mumbai, war has been declared on India”. 150+ casualties. 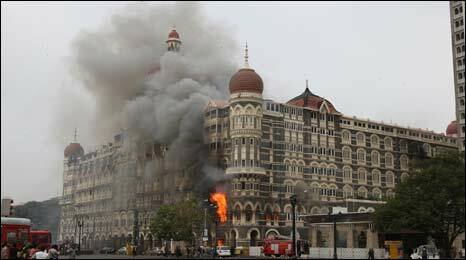 says three sets of explosions at the Nariman house; Indian forces are still fighting at the Taj Hotel. Pan-arab satellite programs and their main internet sites have paid modest attention to the attacks in Mumbai which caused more than 100 deaths, while ‘jihadist’ sites limited themselves to scant comments of celebration. The Qatar broadcast al-Jazeera has had several link-ups with its correspondent there but without following events with a special broadcast. Al-Arabiya, the TV channel broadcasting from Dubai and financed by the Royal Saudi house, also reported the events in Mumbai using its journalists on the scene, but broadcast as part of the usual daily news. On its website Alarabiya.net, the attacks in India are in fourth place, after news on Lebanon, Afghanistan and Saudi Arabia. Another important London-based Saudi news website, Elaph, opens with the Mumbai attacks but along with other photo news on Iraq, sport and medicine. Al-Jazeera has the attacks in India and Afghanistan as its headlines for ‘home in movement’. Islamic extremist forums also give it a low profile, in a ‘posting’ by some subscriber who adds laconically: “Allahu Akbar” (God is Great).